Packed up and shipped off! The last couple weeks have been a fog as I have concentrated completely on finishing up the Master Knitting course so I could mail it today! It has felt like when I was in college during those last two weeks of school studying, writing, pulling assignments together along with extensive research – WHEW! 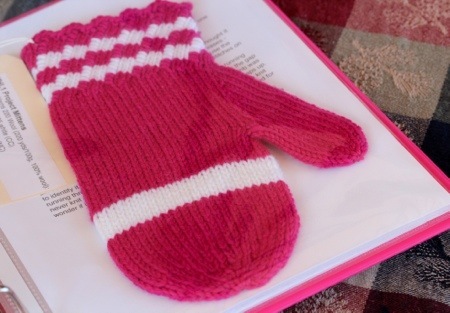 The final knitting project for Level 1 was to knit the mitten pattern included in the course. At first glance I thought it would be a piece of cake but quickly discovered that the cuff was no ordinary cuff. 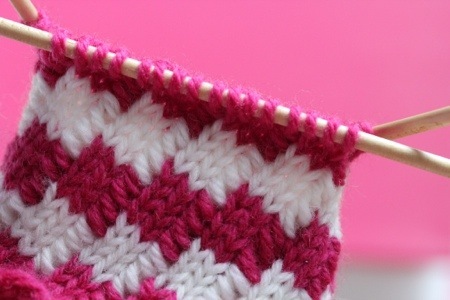 I think I started and restarted the cuff at least five times before I figured the pattern out. I couldn’t figure out where the running thread was between the diagonal stitches and I needed that running thread to pick up a new stitch. On about the fourth try I just happened to peek at the inside of the cuff and saw the running thread because I had changed colors and it was visible in the cerise, can’t miss much with that bright pink color! In this project I had to also demonstrate the ‘jogless’ color change and how to weave in the numerous tails that come when you change colors. 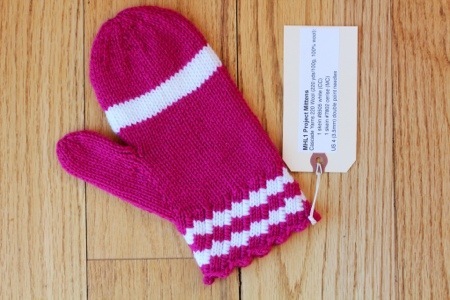 I also had do do something about the hole in the gusset that almost always occurs when you make mittens. I will confess right here and now that I was not please with this gusset and will not be surprised if the committee asks me to re-knit the mitten. I finished the bibliography and research paper yesterday. 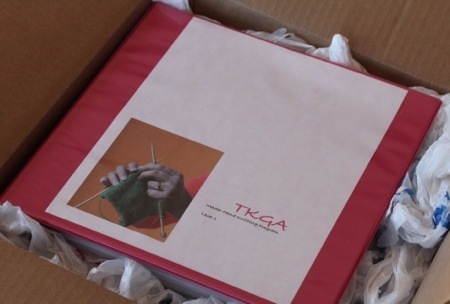 The research on blocking and caring for hand knits was very insightful and I feel more confident in choosing a blocking method that Is the correct method for that finished project rather than using one just because I don’t know any others. This entry was posted in Level 1, Master Knitting Program, Mittens by socksformum. Bookmark the permalink. Congratulations Becky….Are you feeling better? I will miss Saturday’s group because it is the monthly Lace meeting in Denver. I may miss next week also for the PPUrban Gardenmeeting in Co Springs. Hope to see youi soon. Congratulations. I’m really moving on the Level 2, but still have the big stuff to do. Three projects (one small, one medium, one large), the last book review and the history report. The projects are quite time-consuming, and the report writing won’t take too long, but the gathering info and putting it into some coherent order is taking a long time–and then I leave it for a few days and forget where I was. But it sure is worth it. That mitten looks real good to me. It must be a great relief to finish all that work (swatching and researching). I am sure you did a great job. I know we don’t know each other…but for what it is worth, I am very proud of you. Envious too, reckon, but I don’t have the courage to start the process. You are one of my favorite knitters. And a very special person. Thank you for giving us a peek into your world. Thank you for sharing all the aspects of your work, and not just perfectionism. You made me smile with your charming mitten, and you gave me the gumption to keep on chuggin’ along.